Why should we pay attention to environmental diplomacy in International Relations? And how should we seek to understand and explain environmental diplomacy? In the following chapter, I begin by outlining some of the challenges facing diplomacy and diplomatic studies together with some recent theoretical responses to these challenges. Focusing on two examples of important changes in global environmental governance, this chapter argues that environmental diplomacy plays a significant role and that practice theory and narrative theory offer better models of analysis than more mainstream institutionalist, regime theory, multilevel governance or discourse theory approaches. Narratives are seen as discursive constructs but also as constructed by and constructive of the practices through which environmental governance is pursued. The two chosen phenomena of the United Nations Framework Convention on Climate Change (UNFCCC) negotiations and green growth governance are central today and will likely continue to be so as the world negotiates the transition to an environment- and climate-friendly economy. Some are optimistic in relation to the impact of renewable energy, finding that ‘the question is no longer if the world will transition to cleaner energy, but how long it will take’ (Randall, 2015). Others might be more realistic when describing the political challenges, stating that ‘it is clear that if the world is to move towards a significantly more carbon-efficient and climate-resilient pathway of economic growth, a much more compelling economic case for action has to be made’ (The New Climate Economy, 2015). Whichever of the above routes is subscribed to, the world clearly appears to be in a transitional phase. In practice, environmental diplomacy offers considerable insight for International Relations to understand and explain this transformation. Diplomacy is hardly a new topic in IR, and several works have been written in relation to different aspects of diplomacy, such as the dialogue between states and how Western-style diplomacy has come to dominate world politics (Watson, 1982; Bull and Watson, 1984), the United Nations (UN) conference diplomacy (Kaufmann, 1988) or environmental diplomacy (Benedick, 1998; Chasek, 2001; Susskind et al., 2014). Nor is it new that diplomacy and diplomatic studies are seen as irrelevant, criticised as dangerous (Wiseman, 2011: 710) or characterised as the poor child of IR (Pouliot and Cornut, 2015: 297). While they may have been written off in the face of globalisation and increased nationalism, diplomacy and diplomatic studies are alive and kicking, as exemplified by the recent Oxford Handbook of Modern Diplomacy (Cooper et al., 2013), the four-volume set International Diplomacy (Neumann and Leira, 2013) and Diplomacy and the Making of World Politics (Sending et al., 2015). The classic understanding of diplomacy is that of negotiation, persuasion and dialogue between equal and sovereign states performed by a highly educated corps of Ministry of Foreign Affairs (MFA) civil servants/diplomats (see Kaufmann, 1988). This image is being challenged in many ways. Here, I highlight just three: 1) diplomacy is also practiced by non-MFA civil servants and non-state actors (e.g. Neumann, 2002; Cooper et al., 2013); 2) diplomacy as practice takes place according to an international pecking order or social field, in which some states and diplomats are higher up the hierarchy than others – power in practice is relational (Adler-Nissen and Pouliot, 2014); and 3) there is an ontological discrepancy between the world of diplomats and mainstream IR scholarship (Adler-Nissen, 2015) to the effect that, for example, ‘American IR theory now lags behind American diplomatic practice’ (Wiseman, 2011: 711). The classic image of diplomacy has been replaced by an image of hybrid diplomacy with multiple actors, multiple issues and multiple practices. Leading up to COP-16, ‘key players [said] a further breakdown in fresh discussions […] could spell the end of the UN multilateral negotiating process’ (Willis, 2010), leading to climate minilateralism in fora such as G8, G20 or maybe only the G2 (the United States and China) (Casey-Lefkoeitz, 2010). The COP-15 setback should be understood in relation to concurrent trends relating to the increasing institutional fragmentation of global environmental governance (Zelli and Van Asselt, 2013), climate experimentation (Hoffmann, 2011) and transnational climate change governance arrangements (Bulkeley et al., 2014). Despite these tendencies and new spaces of climate governance, UNFCCC negotiations got back on track. Both within and outside the UNFCCC, we see new diplomatic communities and global partnerships being formed to address the challenges of a needed transition to a new economic system. These two general fields of global environmental governance also overlap. COP-16 reached a consensus understanding, adopted the Cancun Agreements and re-established some trust and legitimacy in the UNFCCC. COP-17 in Durban, South Africa, delivered a text known as the Durban Platform. COP-21 in Paris, France, has delivered a new global agreement in 2015. COP-18 in Doha, Qatar, managed to finish the old negotiations from COP-13 (the Bali Action Plan) and set a more detailed timetable for the Durban Platform (Christoff and Eckersley, 2013: 118; UNFCCC, 2014a; 2014b). COP-18 also formally adopted a second commitment period under the Kyoto Protocol. In a recent analysis based on a large number of interviews with negotiators, it is argued that the diplomatic efforts of the Mexican COP presidency, which was anchored in the MFA, and informal dialogues such as the Cartagena Dialogue for Progressive Action made the difference in getting negotiations back on track (Monheim, 2015: 29–62). Blaxekjær and Nielsen (2014) have further demonstrated that new political groups such as the Cartagena Dialogue have changed the narrative landscape of negotiations, thus creating a new possible space of constructive negotiations. Korea and Denmark, together with COP-16 host Mexico, began promoting green growth in connection with UNFCCC events as a supplementary process to the UNFCCC negotiations, and they established the Green Growth Alliance in 2010. This alliance was joined by China, Kenya and Qatar in 2012, Ethiopia in 2014 and Vietnam in 2015. Korea and Denmark have been shaping green growth to encompass public–private partnerships through investments in the green sector and market-driven principles but have still actively connected green growth in order to contribute to global sustainable development and poverty eradication. One purpose besides fighting climate change seems to be to position Korea, Denmark and Mexico as responsible members of the global community – with the bridging of the North–South divide as a central goal of the Green Growth Alliance. In 2010, with Danish financial support, Korea established the Global Green Growth Institute (GGGI), and Denmark initiated the Global Green Growth Forum (3GF). Since 2012, GGGI has been a full-fledged international organisation, operating as a forum for partners and as the secretariat of the Green Growth Alliance placed in Denmark’s Ministry of Foreign Affairs. Both 3GF and GGGI have actively promoted green growth at their own summits and to other platforms, such as the UNFCCC, G20 and Rio+20 summits. The Cartagena Dialogue and 3GF exemplify important changes in global environmental governance in which diplomacy plays a critical role. These examples could be analysed with the dominant global environmental governance approaches, regime theory or multi-level governance theory (Okereke and Bulkeley, 2007). The choice of one over the other will skew the analysis, however, as some theoretical/empirical problems are yet to be resolved. Regime theory is skewed towards states and material interests at the international level, missing the importance and independent role of non-state actors, ideas and governance on multiple levels. Multi-level governance theory takes the opposite stance. Both seem to miss the critical role played by state and non-state diplomats. The climate negotiations literature generally falls within the rationalist, constructivist and descriptive approaches (Dimitrov, 2013: 340). The first two are often theoretical, whereas the latter is often policy-oriented. The rationalist or interest-based approaches often take the shape of hypotheses, which shape our understanding of negotiations as dichotomous: ‘agreement/no agreement, action/no action, or cooperation/conflict’ as the only options (Bernstein, 2001: 10). IR has recognised the gap between meso-level institutions and micro-level practices to some extent, especially in relation to issues of trust and cooperation (Farrell, 2009; Walker and Ostrom, 2009). Further, Holmes (2013: 829) argues that personal relationships in negotiations can promote cooperation, because ‘[f]ace-to-face meetings allow individuals to transmit information and empathize with each other, thereby reducing uncertainty, even when they have strong incentives to distrust the other’. The IR literature is on its way to be both theoretically informed and empirically strong and thus to pay closer attention to the diplomats and governance practices (Eckersley, 2012; Audet, 2013; Bauer, 2013: 332; Dimitrov, 2013: 346). Research and researchers must engage in and interpret the field. It builds on what Wagenaar calls dialogic meaning in action, where ‘[i]t doesn’t make sense to try to locate meaning ontologically in the mind or in some reified cultural or institutional pattern’ (Wagenaar, 2011: 21). Researchers should approach meaning through the study of social action as something that is both particular to the specific actor and moment and also generally meaningful, because it signifies something larger. As such, this understanding of international practices fits well with the new hybrid image of diplomacy. It is also argued that diplomatic studies and practice theory can learn a lot from each other (Pouliot and Cornut, 2015). Furthermore, this approach can benefit from insights from a narrative approach as a way of including and analysing strategic rhetoric, language and discourse to take us outside the text but still keep texts as important sources and as examples of practices, especially in negotiations and diplomacy (Blaxekjær and Nielsen, 2014). [Meaning] is more a shared set of understandings that are linguistically and actionably inscribed in the world, and that are invoked, and, in an ongoing dialectical movement, sustained, whenever actors engage in a particular behavior, and whenever we ‘read’ the symbolic meaning of that particular behavior. (Wagenaar, 2011: 21). Gaining access to practices is the first task to be overcome by the researcher. This is not always possible due to practical barriers and the secret nature of diplomacy (although the hybrid version is less secret). However, ‘even when practices cannot be “seen”, they may be “talked about” through interviews or “read” thanks to textual analysis’ (Pouliot, 2013: 49). In the following, I turn to a brief analysis of the Cartagena Dialogue and the 3GF as sites of environmental diplomacy. Diplomacy in the form of dialogue is hardly a new phenomenon in UNFCCC negotiations. Examples include the Greenland Dialogue on Climate Change, which existed from 2005 to 2009 and was launched by the Danish COP-15 presidency (Meilstrup, 2010: 120); the Petersberg Dialogue, co-hosted by Germany and Mexico in 2009; the Geneva Dialogue on Climate Finance, co-hosted by Mexico and Switzerland in 2009 (Monheim, 2015: 50–51); and the more recent Toward 2015 Dialogue, convened by the Centre for Climate and Energy Solutions (C2ES, 2015). These discussions can best be described as high-level meetings preparing for a specific COP. Yet, the Cartagena Dialogue is different and better described as a political group or community that works in and between COPs (Blaxekjær and Nielsen, 2014). The Cartagena Dialogue was officially formed in March 2010 in Cartagena, Colombia, by UNFCCC negotiators and experts from around 30 parties representing all regions. It did not suddenly emerge; many experienced negotiators from the European Union (EU), the Alliance of Small Island States (AOSIS), the Least Developed Countries (LDCs) and Latin America and the Caribbean (LAC) had cultivated an informal community for many years, but it was the common experience of failure at COP-15 and the feeling of being excluded from influence when USA and BASIC (i.e. Brazil, South Africa, India and China) negotiated the Copenhagen Accord that brought negotiators together more formally. The founding meeting resulted in an understanding of the community as ‘an informal space, open to countries working towards an ambitious, comprehensive and legally binding regime in the UNFCCC, and committed domestically to becoming or remaining low-carbon economies’ (as reported by Lynas, 2011, who worked for the Maldives at the time; corresponding to UNFCCC webpage; confirmed by own interviews). Participants agreed to be explicit about the Cartagena Dialogue not being described as a political group but rather as a dialogue with participants instead of members (as pointed out by all of the interviewees). Common to communities of practice is that they consist of a basic structure defined as 1) a community of people who care about an issue, 2) a domain of knowledge, which defines a set of issues, and 3) the shared practices that they are developing to be effective in their domain. To identify a community of practice, one must go beyond the abstract and desk-based studies: ‘You have to look at how the group functions and how it combines all three elements of domain, community, and practice’ (Wenger et al., 2002: 44). The Cartagena Dialogue illustrates a major change in global environmental governance, because it is a new kind of diplomatic community bridging North and South positions by redefining the longstanding, dividing principle of Common But Differentiated Responsibility (CBDR). Through collaborative and dialogic work beginning with the common interest in understanding the views of other parties, building further trust at the personal level and then working together to explore possible common ground on specific negotiation issues, the Cartagena Dialogue played an important role in getting climate negotiations back on track after the breakdown at COP-15 (Blaxekjær, 2015). The Cartagena Dialogue is a community that thrives on boundary spanning as a defining practice whereby necessary face-to-face dialogue between North and South and between political groups actually takes place; necessary, because it creates the basis for trust, learning and new ideas, which contribute to negotiations moving forward. Participants in the Cartagena Dialogue have changed their normal negotiation practices. They now find it easier and are more comfortable communicating with one another if/when they need something clarified. This increased level of frank communication across the North–South divide is an important change. Text is central to climate negotiations. And although the Cartagena Dialogue does not produce official statements and submissions, their new diplomatic practices include taking notes of common ground on various issues. This common language finds its way into the submissions and statements of the respective delegations. Both the Mexican and South African COP presidencies were able to use the Cartagena Dialogue as a sounding board for difficult issues. After the failure of COP-15, where especially the EU, AOSIS and LDC felt they were excluded from influence, the Cartagena Dialogue has become a community of practice, where parties supporting a global, action-oriented approach can engage with one another and develop compromises based on in-depth knowledge of the other parties’ positions and reasoning. Such compromises have the potential to be strong and long-lasting and put pressure on laggards. These practices and their organisation in a community are part of a new narrative in UNFCCC negotiations, where CBDR is reinterpreted to also mean that developing and developed countries alike should take as ambitious action as possible, including mitigation (for full analysis, see Blaxekjær, 2015). Previous research by the author (Blaxekjær, 2015) has highlighted how green growth is being carved out as a new global environmental governance subfield, which confirms three trends in global environmental governance: a) the increasing institutional fragmentation of global environmental governance (Zelli and Van Asselt, 2013); b) that activities, initiatives and networks fit under a broad neoliberal discourse (Bernstein, 2001; Bulkeley et al., 2014); and c) that all regions of the world experience the emergence of new partnerships that cross North and South and link public and private actors (Bulkeley et al., 2014; Blaxekjær, 2015). I also observe that orchestration – or governmentality as the conduct of conduct in governance and discursive terms – is an important part of this hybrid diplomacy. It is important to study and understand the orchestrating role played by diplomacy in these new, overlapping environmental governance fields if we want to be able to explain how global politics unfolds. The concept of hybrid diplomacy is receiving increasing attention; however, a Google Scholar search reveals that IR has not developed a theory of hybrid diplomacy as such. As Sending et al. (2015: 1) note, ‘as we enter the twenty-first century, everybody seems to agree that diplomacy is changing, yet few people can specify exactly how – and with what effects on world politics’. From a practice perspective, I understand hybrid diplomacy as a category of practice which, on the one hand, includes and mixes not just different issues (e.g. political, economic, environmental) and different actors (professional diplomats, other civil servants, and non-state actors) but also different practices; that is, expanding our understanding of what diplomacy is in practice. On the other hand, I understand hybrid diplomacy as a category of analysis with three dimensions: ‘first, diplomacy is a process (of claiming authority and jurisdiction); second, it is relational (it operates at the interface between one’s polity and that of others); and third, it is political (involving both representation and governing)’ (Sending et al., 2015: 6). In this sense, it is advisable to analyse political and governing processes and relations as constituent of ‘how diplomacy is involved in generating agents (e.g. states), objects (e.g. treaties, embassies), and structures (sovereignty)’ (Sending et al., 2015: 7). Thus, the term hybrid refers to both the first category of practice and the category of analysis, the latter being a mix of especially practice theory approaches (Pouliot and Cornut, 2015), and also the fact of being analysed by diplomats, scholars and scholar-diplomats. Green growth governance as an empirical phenomenon lives up to the above definitions, because when there is contact between polities, there is diplomacy at work. 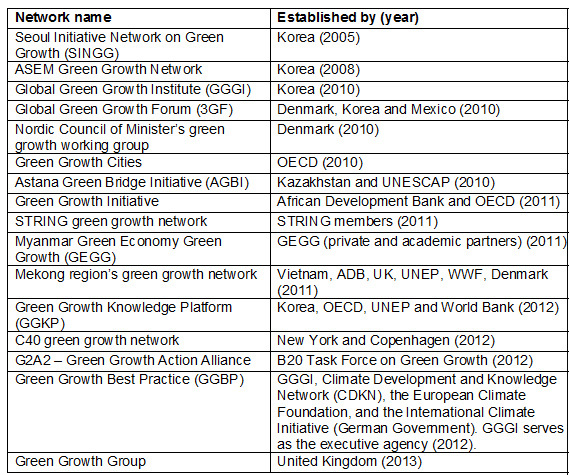 In Table 1 below, I have listed most of these new specific green growth networks established in the period 2005–2013. All networks have international participants. These networks are the new spaces and places where global environmental governance – governing and governmentality – is forged through diplomacy. Source: Adapted from Blaxekjær (2015). Through GGA and 3GF we can observe how diplomacy has become hybrid in relation to issues, participating actors, and their practices. The GGA is an unusual international alliance between sovereign states; countries that we would expect to cooperate bilaterally but not in a minilateral alliance, because they are very diverse and belong to very different groups in political, economic, cultural and climate terms. These are not countries one would expect to work together in the UNFCCC, but the GGA works for the same kinds of goals as the UNFCCC. The 3GF secretariat is hosted by Denmark under the auspices of the Ministry of Foreign Affairs and run by career diplomats. The GGA seeks to foster and develop global public–private partnerships capable of contributing to the transformation to a global green economy. This work is strategically connected with global and regional processes such as the UNFCCC, SDGs or different water and energy programmes. There is a growing literature on green growth (for a review, see Blaxekjær, 2015), but it has primarily overlooked the new hybrid diplomacy at play and has not asked why, for example, actors who are in different UNFCCC groupings and oftentimes in opposition are suddenly working together in the GGA. The 3GF annual conference was first held in 2011, and the first three conferences were attended by heads of state, UN secretary-general Ban Ki-moon, royalty, CEOs, directors from OECD, the World Bank and UN agencies, as well as financial institutions, and a few researchers and NGOs. Although these first-tier leaders participated with engagement and resolution, the mode has shifted since 2014 towards getting the second-tier leaders together to get closer to the implementation of new partnerships and work plans. 3GF is also being repositioned to support and facilitate the implementation of COP-21 and SDGs. Issues are also multiple, ranging from mitigation, adaptation, water management, information, urban planning and development, agriculture, energy, transport, and more. The practices are multiple: the traditional practices in international politics, such as conferences, meetings in own and other countries (e.g. 3GF has held other meetings in Chile, Colombia, China and Kenya), MOUs, strategic communication, networking, displaying technological solutions, and cultural packaging with dinners and concerts. The non-traditional practices include a strong focus on bridge-building between North and South partners, public and private partners, and bringing in a range of diverse actors who would not normally meet at workshops to actually develop partnerships (not just talk about good ideas). Non-traditional for an MFA-organised conference is the use of popular practices mimicking TV; e.g. with an expert panel of devil’s advocates evaluating new partnership proposals, or broadcasting storytellers from the future. The interviewees agree that the combination of meeting interesting people and actually getting down to work makes attendance worthwhile despite an overbooked calendar. Why should we pay attention to environmental diplomacy in International Relations? And how should we seek to understand and explain environmental diplomacy? In general, new IR scholarship is challenging the hitherto weak position of diplomacy and diplomatic studies in IR. We see that the classic image of diplomacy has been replaced by an image of hybrid diplomacy with multiple actors, multiple issues and multiple practices. There are good reasons to highlight environmental diplomacy as emblematic, since this area of global governance will have a strong impact on the reorganisation of the global political economy facing climate change and other environmental threats. The orchestrating role that diplomacy plays in these new, overlapping environmental governance fields is important to study and understand if we want to be able to explain how global politics unfolds. Second, as argued in this chapter and in the international practices literature, international practices and narratives are central to better understanding and explaining the important role of hybrid diplomacy in global environmental governance. What the cases of the Cartagena Dialogue in UNFCCC negotiations and the Global Green Growth Forum (3GF) and other green growth networks illustrate is that (new) communities in which the representatives of polities meet can be studied according to their practices, but more, we begin to notice how environmental diplomacy is shaped by and shaping the existing neoliberal world order. It is worth noting, too, that many networks assume the form of partnerships, which suggests that we should also focus on partnerships in practice as a central element in new narratives of global environmental governance. This chapter was written prior to COP-21 in Paris, 30 November to 12 December 2015. The truly global Paris Agreement between 196 states warrants a postscript. A main conclusion by participants and observers is that French diplomacy made the agreement possible. Other observations fit the above conclusion. First, new partnerships as part of the diplomatic practices were instrumental. The US-China climate partnership launched in 2014 helped solve longstanding disagreements between these countries through e.g. a new ‘enhanced policy dialogue’ (NDRC, 2014: 8). And, in the last week of COP-21, a new partnership known as ‘The High Ambition Coalition’ was launched by a group of parties crossing the North–South divide. There is still some confusion as to establishment, participation and purposes; however, it became clear in the last two days of negotiations that the diplomatic efforts of leading countries and groups in this High Ambition Coalition (the Marshall Islands, Colombia, Mexico, the Gambia, the EU, the US, Norway, Canada, LDCs and AILAC) embodied the last push for the Paris Agreement. Second, central green growth actors were present at COP-21, and I would like to highlight GGGI’s high-level event and launch of the Inclusive Green Growth Partnership which – because of its regional and financial anchoring – is likely to play a key role in the implementation of the Paris Agreement. The partners are the Asian Development Bank, the African Development Bank, the Inter-American Development Bank, and United Nations Regional Economic and Social Commissions – the Economic and Social Commission for Asia and the Pacific, the Economic Commission for Africa, the Economic Commission for Latin America and the Caribbean, and the Economic and Social Commission for Western Asia (GGGI, 2015). *This chapter largely builds on my PhD dissertation (Blaxekjær, 2015) and engagement with the global environmental governance field. Adler, E. (2008). The Spread of Security Communities: Communities of Practice, Self-Restraint, and NATO’s Post—Cold War Transformation. European Journal of International Relations, 14(2), 195-230. Adler E. and Pouliot V. (eds) (2011). International Practices. Cambridge: Cambridge University Press. Adler-Nissen, R. (ed.) (2013). Bourdieu in International Relations: Rethinking Key Concepts in IR. London and New York: Routledge. Adler-Nissen, R. (2015). Conclusion: Relationalism or Why Diplomats Find International Relations Theory Strange. In: O. J. Sending, V. Pouliot, and I. B. Neumann (eds). Diplomacy and the Making of World Politics (pp. 284-308). Cambridge: Cambridge University Press. Adler-Nissen, R. and Pouliot, V. (2014). Power in Practice: Negotiating the International Intervention in Libya. European Journal of International Relations, 20(4), 889-911. Audet, R. (2013). Climate Justice and Bargaining Coalitions: A Discourse Analysis. International Environmental Agreements, 13(3), 369-386. Bauer, S. (2013). Strengthening the United Nations. In: R. Falkner (ed.). The Handbook of Global Climate and Environment Policy, 1st Edition (pp. 320-338). Chichester: Wiley. Benedick, R. E. (1998). Ozone Diplomacy: New Directions in Safeguarding the Planet. Enlarged Edition. Cambridge, MA: Harvard University Press. Bernstein, S. (2001). The Compromise of Liberal Environmentalism. New York: Columbia University Press. Bigo, D. (2005). Global (In)security: The Field of the Professionals of Unease Management and the Ban-Opticon. In: N. Sakai and J. Solomon (eds). Traces: A Multilingual Series of Cultural Theory, 4 (Translation, Biopolitics, Colonial Difference) (pp. 34-87). Hong Kong: Hong Kong University Press. Bigo, D. and Madsen, M. R. (eds) (2011). Bourdieu and the International – Special Issue. International Political Sociology, 5(3): 219-347. Blaxekjær, L. Ø. (2015). Transscalar Governance of Climate Change: An Engaged Scholarship Approach. Copenhagen: Department of Political Science, University of Copenhagen. PhD series 2015/8. Blaxekjær, L. Ø. and Nielsen, T. D. (2014). Mapping the Narrative Positions of New Political Groups under the UNFCCC. Climate Policy. Published online 17 October 2014. Brown, C. (2012). The ‘Practice Turn’, Phronesis and Classical Realism: Towards a Phronetic International Political Theory? Millennium: Journal of International Studies, 40(3), 439-456. Bull, H. and Watson, A. (eds) (1984). The Expansion of International Society. Oxford: Clarendon Press. Bulkeley, H., Andonova, L. B., Betsill, M. M., Compagnon, D., Hale, T., Hoffmann, M. J., Newell, P., Paterson, M., Roger, C. and Vandeveer, S. D. (2014). Transnational Climate Change Governance. New York: Cambridge University Press. C2ES (2015). Toward 2015: An International Climate Dialogue. The Centre for Climate and Energy Solutions. Casey-Lefkowitz, S. (2010, December 11). New International Agreement to Fight Climate Change Found Spirit for Consensus in Cartagena Dialogue Countries. Switchboard: Natural Resources Defense Council Staff Blog. Chasek, P. S. (2001). Earth Negotiations: Analyzing Thirty Years of Environmental Diplomacy. Tokyo: United Nations University Press. Christoff, P. and Eckersley, R. (2013). Globalization of the Environment. Plymouth: Rowman & Littlefield. Cooper, A. F., Heine, J. and Thakur, R. (eds) (2013). The Oxford Handbook of Modern Diplomacy. Oxford: Oxford University Press. Dimitrov, R. S. (2010). Inside Copenhagen: The State of Climate Governance. Global Environmental Politics, 10(2), 18-24. Dimitrov, R. S. (2013). International Negotiations. In: R. Falkner (ed.). The Handbook of Global Climate and Environment Policy, 1st Edition (pp. 339-357). Chichester: Wiley. Eckersley, R. (2012). 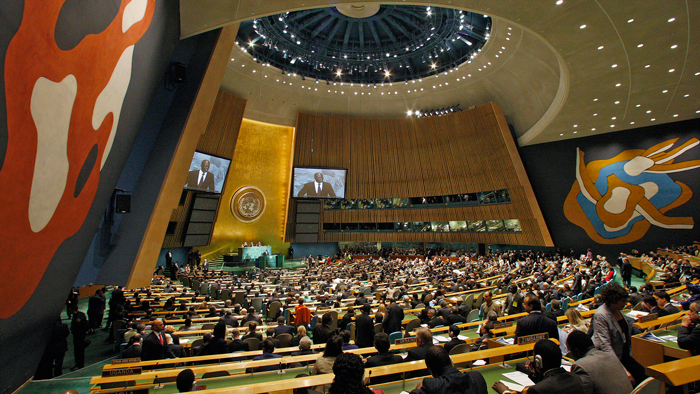 Moving Forward in the Climate Negotiations: Multilateralism or Minilateralism? Global Environmental Politics, 12(2), 24-42. Elliot, L. (2013). Climate Diplomacy. In: Cooper, A. F., Heine, J. and Thakur, R. (eds) (2013). The Oxford Handbook of Modern Diplomacy (pp. 840-856). Oxford: Oxford University Press. European Commission (2015, December 8). EU and 79 African, Caribbean and Pacific Countries Join Forces for Ambitious Global Climate Deal. Press release. Farrell, H. (2009). Institutions and Midlevel Explanations of Trust. In: K. S. Cook, M. Levi, and R. Hardin (eds). Whom Can We Trust? How Groups, Networks, and Institutions Make Trust Possible (pp. 127-148). New York: Russell Sage Foundation. GGGI (2015, December 7). New Global Initiative Launches at COP21 to Boost Green Growth Financing. Global Green Growth Institute. Harvey, F. (2015, December 14). Paris Climate Change Agreement: The World’s Greatest Diplomatic Success. The Guardian. Hoffmann, M. J. (2011). Climate Governance at the Crossroads: Experimenting with a Global Response after Kyoto. New York: Oxford University Press. Holmes, M. (2013). The Force of Face-to-Face Diplomacy: Mirror Neurons and the Problem of Intentions. International Organization, 67(4), 829-861. Kaufmann, J. (1988). Conference Diplomacy. An Introductory Analysis. 2nd Revised Edition. Dordrecht: Martinus Nijhoff Publishers. Lynas, M. (2011, March 10). Thirty ‘Cartagena Dialogue’ Countries Work to Bridge Kyoto Gap. Meilstrup, P. (2010). The Runaway Summit: The Background Story of the Danish Presidency of COP15, the UN Climate Change Conference. In: N. Hvidt and H. Mouritzen (eds). Danish Foreign Policy Yearbook 2010 (pp. 113-135). Copenhagen: Danish Institute for International Studies. Monheim, K. (2015). How Effective Negotiation Management Promotes Multilateral Cooperation: The Power of Process in Climate, Trade, and Biosafety Negotiations. New York: Routledge. NDRC (2014). Report of the U.S.-China Climate Change Working Group to the 6th Round of the Strategic and Economic Dialogue, July 9, 2014. National Development and Reform Commission. Neumann, I. B. (2002). Returning Practice to the Linguistic Turn: The Case of Diplomacy. Millennium: Journal of International Studies, 31(3), 627-651. Neumann, I. B. and Leira, H. (eds) (2013). International Diplomacy. Four vols. London: Sage Publications. Okereke, C. and Bulkeley, H. (2007). Conceptualizing Climate Change Governance Beyond the International Regime: A Review of Four Theoretical Approaches. Norwich: Tyndall Centre for Climate Change Research. Working Paper 112. Pouliot, V. (2008). The Logic of Practicality: A Theory of Practice of Security Communities. International Organization, 62(2), 257-288. Pouliot, V. (2013). Methodology. In: R. Adler-Nissen (ed.). Bourdieu in International Relations: Rethinking Key Concepts in IR (pp. 45-58). New York: Routledge. Pouliot, V. and Cornut, J. (2015). Practice Theory and the Study of Diplomacy: A Research Agenda. Cooperation and Conflict, 50(3), 297-315. Randall, T. (2015, April 14). Fossil Fuels Just Lost the Race Against Renewables. Bloomberg Business. Sending, O. J., Pouliot, V. and Neumann, I. B. (eds) (2015). Diplomacy and the Making of World Politics. Cambridge: Cambridge University Press. Susskind, L. E., Ali, S. H. and Hamid, Z. A. (2014). Environmental Diplomacy: Negotiating More Effective Global Agreements. Oxford: Oxford University Press. The New Climate Economy (2015). Aims and Rationale. UNFCCC (2014a). Now, Up To and Beyond 2012: The Bali Road Map. UNFCCC (2014b). Durban: Towards Full Implementation of the UN Climate Change Convention. Wagenaar, H. (2011). Meaning in Action. Interpretation and Dialogue in Policy Analysis. Armonk and London: M. E. Sharpe. Walker, J. and Ostrom. E. (2009). Trust and Reciprocity as Foundations for Cooperation. In: K. S. Cook, M. Levi, and R. Hardin (eds). Whom Can We Trust? How Groups, Networks, and Institutions Make Trust Possible (pp. 91-124). New York: Russell Sage Foundation. Watson, A. (1982). Diplomacy: The Dialogue between States. London: Eyre Methuen. Wenger, E., McDermott, R. and Snyder, W. M. (2002). Cultivating Communities of Practice: A Guide to Managing Knowledge: Cultivating Communities of Practice. Cambridge, MA: Harvard Business School Press. Willis, A. (2010, November 29). UN Method Hangs in the Balance as Climate Talks Begin. EU Observer. Wiseman, G. (2011). Bringing Diplomacy Back In: Time for Theory to Catch Up with Practice. International Studies Review, 13, 710-713. Wiseman, G. (2015). Diplomatic Practices at the United Nations. Cooperation and Conflict, 50(3), 316-333. Zelli, F. and Van Asselt, H. (eds) (2013). Introduction: The Institutional Fragmentation of Global Environmental Governance: Causes, Consequences, and Responses. Global Environmental Politics, 13(3), 1-13. Lau Øfjord Blaxekjær holds a PhD in Political Science from the University of Copenhagen. Currently, he researches and teaches at the University of the Faroe Islands, where he is Assistant Professor and Programme Director of the Masters in West Nordic Studies, Governance and Sustainable Management – a joint Master’s Degree with participating universities from Greenland, Iceland and Norway. He has also been visiting professor at the Sino-Danish Centre for Education and Research in Beijing, China. His research interests include global governance, climate change, energy, risk society, Anthropocene, green growth, and theories of power, rhetoric and narrative as well as research and education in a transdisciplinary perspective. He is co-author of ‘Mapping the narrative positions of new political groups under the UNFCCC’, in Climate Policy (2014, with T. D. Nielsen).